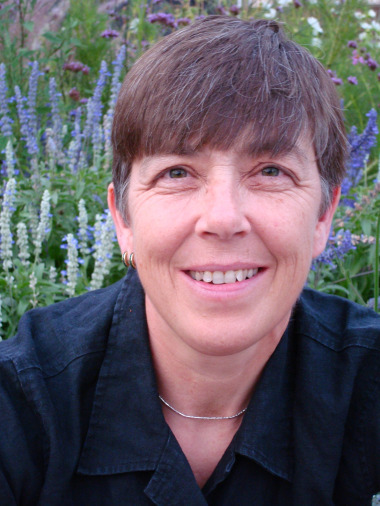 Cath Hassell understands the power of crowd-funding – and how it can give an idea its wings. When it comes to crowd-funding, it’s often the outrageously successful campaigns that grab the headlines. 3D gaming goggles or smart watches that smash their targets in days – and go on to raise millions. But what’s the story when it comes to projects that are more modest? How does it work for you if you’ve got an environmental message that you’re serious about sharing – but don’t have the resources to do it? Cath Hassell is the person to ask. She runs a small environmental consultancy called ech2o, which does a lot of work with schools inspiring children to get serious about the environment. 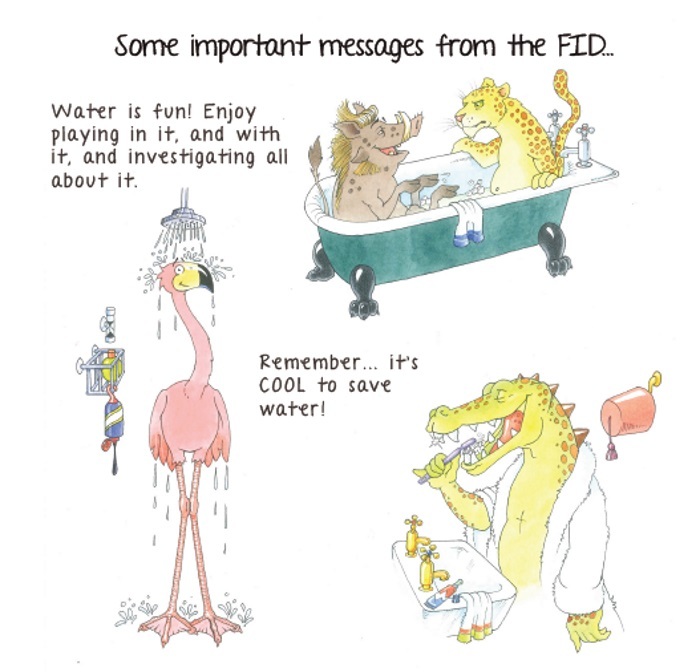 Cath turned to crowd-funding to finance the final stages of a book she’d been working on about the importance of using water sustainably. The idea for the book had been brewing for some time. But it was her experience in school that finally gave her the decisive push to get things properly off the ground. “With ech2o, we do a lot of work with school children and a lot of water workshops,” said Cath. “We always had stuff to use with Key Stage 2 level kids – aged seven to eleven – but we realised we never had anything for primary-aged kids of five or six. 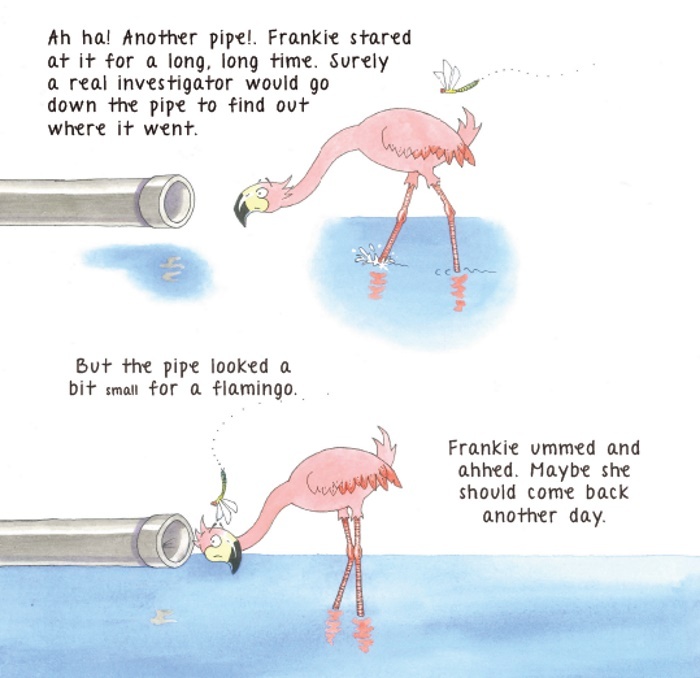 And so, Frankie the Flamingo, the main character in her book, was born. While it’s true the idea had been conceived some time before, it was this moment of epiphany that helped Cath finally put the feathers on Frankie. The book’s plot is great. 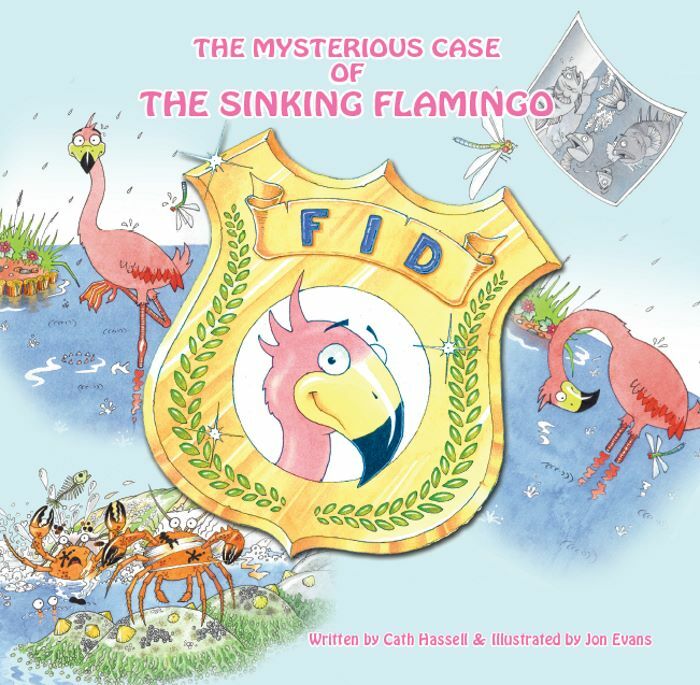 Frankie, an inquisitive flamingo, thinks she’s sinking and sets off to do some detective work to find out why. 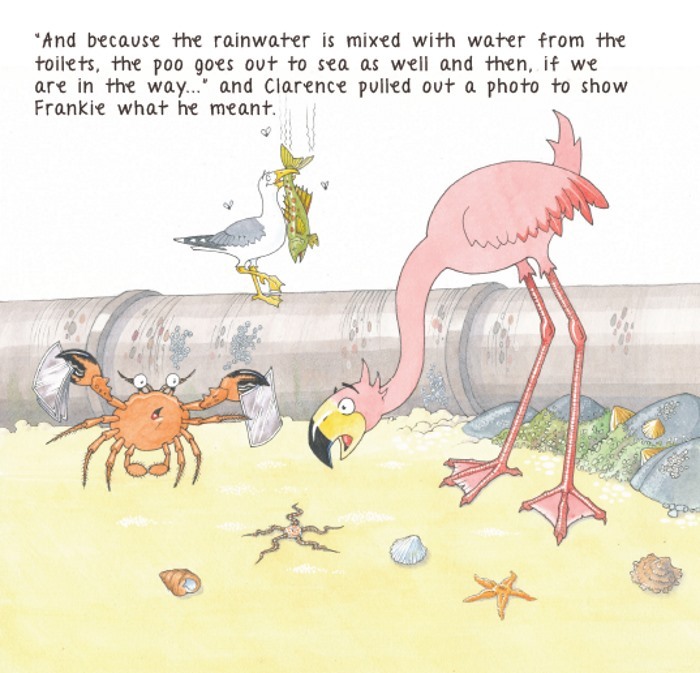 On the way she learns all about water, drains and sewers – and the best ways to save water. The idea to give Frankie her wings through crowd-funding actually came quite late. The book was already written and partly designed before Cath turned to crowd-funding website Kickstarter to get the book finished and published. After choosing the Kickstarter platform to host her campaign, Cath got the ball rolling. The site asks members to set up a page featuring a written summary of the campaign, the amount they want to raise, details of rewards they offer and a video to market their project. After that, you get a maximum of 60 days to raise your total. If you come up short, you get nothing. To prevent projects from failing, Kickstarter recommends you host an initial launch party to get your nearest and dearest contributing first. After that, it’s down to you to persuade your professional and personal contacts – as well as strangers – to back your passion and help you get your message out there. In the end though, Cath’s decision didn’t prove costly as supporters backed her to the tune of £6,000, doubling her intended target and bringing Frankie to life. She puts her success down to some creative thinking on the rewards she offered – as well as effectively building a buzz on social media. “In terms of rewards, I knew we had to offer more than just the finished books,” said Cath. “So we had a good think and also offered people the chance to donate books to a school of their choice, or for me to go into a chosen school to read the book to children. We also gave away some of the original illustrations, as well as prints. This broad range of rewards worked really well. “I also think we used Twitter really well, which proved a great way of generating interest in the project. We’d found several corporate sponsors before we started the crowd-funding campaign, so I used them as a starting point for our Twitter posts. Overall, Cath admits she found the experience both exhilarating and, at times, slightly dispiriting. “It’s really addictive,” she said. “During the whole thing, you’re getting alerts on your phone telling you somebody has donated and how much they’ve pledged. When it was over, I really missed that. “One thing I found difficult was when someone I knew really well didn’t put money in. That sort of rejection I found really hard. On the other side of that, you find people you don’t even know giving you £200. You think ‘oh my god, that’s so nice’. It feels like real validation of what you’re doing. Once you’ve raised your money you feel a huge amount of responsibility to your supporters and you really want to fulfil your obligations. 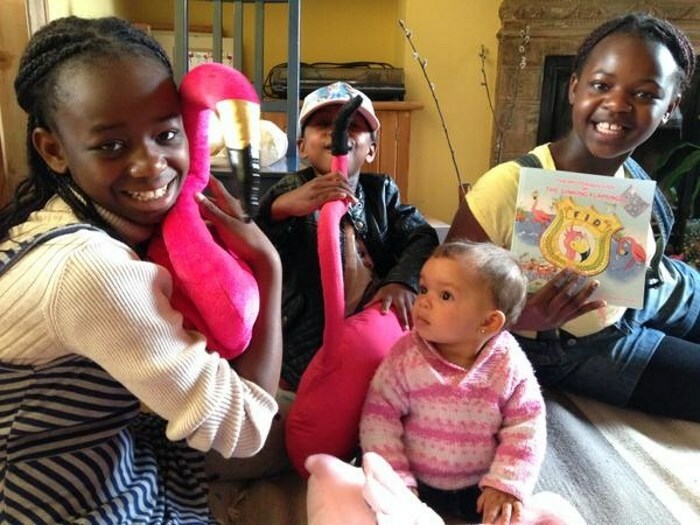 I noticed with a lot of projects on the site, particularly children’s books, that people had written them, but they hadn’t tested them with loads of kids. So I think it’s important to show it’s more than just an idea – you need to be able to show your idea is real and robust. If you ask for £3,000, you need to remember that even if you raise the full amount, you won’t receive all of it. The site takes a percentage and you may also need to pay for extra rewards for your supporters and the cost of sending items out to people. Factor all of those costs into your decision about how much to ask for. I’m quite good at maths, but was shocked how dumb I was at doing the maths for Kickstarter. I decided to do it through my business, ech2o. As a company, we charge VAT. So we now have the issue of whether we’ll have to pay the VAT on our Kickstarter money. I think it might have been better if I’d just gone for it personally. For now, it looks like we’ll spend it all, but then we’ll still have to pay tax on that income. HMRC has clocked on to all the crowd funding money floating around, so my tip would be to research tax properly and really get your head around it. Having chosen £3,000, we then had to think about the rewards we’d offer people in return for their donations. If we’d just gone ‘one book for this amount and 10 for that amount’, it’d be boring. So we decided to mix and match. Our range went from £10 for one copy of the book up to £500 for a corporate sponsor where you got your logo featured in the book. In between, we had rewards where we’d donate books to schools of your choice. Or I’d go into a school of your choice to read the book. We also offered original illustrations, as well as prints. It worked really well and all our rewards were chosen. When I started tweeting, I only had 270 contacts on Twitter. But my contacts were great at retweeting my posts, which meant we ended up creating a good buzz. If you have a really good Twitter and Facebook page, it will definitely help you have a successful campaign. 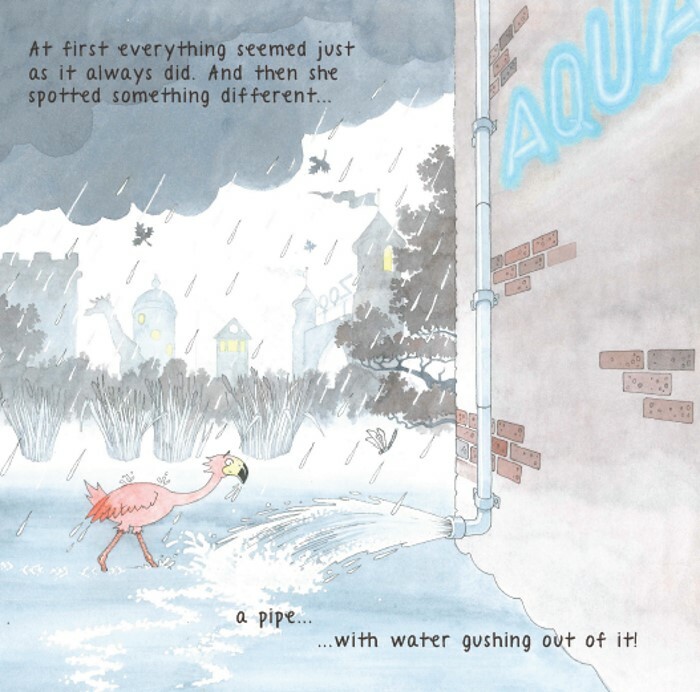 Everything around Frankie the Flamingo is fun, so our Kickstarter page reflected that. So if you’ve got a fun product, make your crowd-funding page fun as well. We also included nice pictures of children reading the book, which was pretty powerful. So if you have interesting photography use it. It’s also important to make a good video. Ben, from Regen Media, kindly produced our video for us to support our project. I think having a professional video really helped our campaign. You can find out more about Cath’s work with sustainable water at www.ech2o.co.uk. Does your business have a message about green building that’s worth sharing? Is there a project you’d like to pursue but you don’t know how to fund it? In this post I’m going to share my experience of crowdfunding a documentary on building better houses, how I realised it and why I know I will be repeating the process in the future. While people rant and rave about climate change, and curl up into a ball because nothing can be done I always try to keep positive. In my mind there is a world of opportunity before us and it is increasingly weighted in favour of those willing to invest in what a sustainable future might look like. Over the last couple of years blogging at House Planning Help I have met people who have come up with elements of this sustainable future, whether it be by creating an energy-efficient house, forming a cohousing group, being careful where their money gets spent or making other significant lifestyle changes such as refusing to fly! That’s why I feel – if we’re not afraid of action – we each have a role to play here. We need to strive for that vision of a sustainable future, in whatever context that means for us, and then share our experiences online.